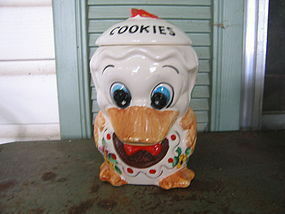 This is not a new piece, but not sure it is old enough to consider as vintage. 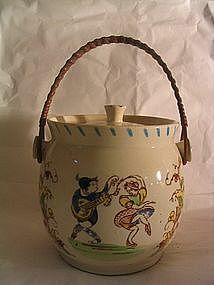 There is a backstamp on the bottom naming it as made in Brazil and handpainted. There is a partial sticker on the side with the same info. It looks very much like Weiss. It is approximately 8 1/2 inches in height. There are no chips, cracks, breaks or repairs. There are several areas of stray paint from the decorating process. I need your zip code to calculate the postage. 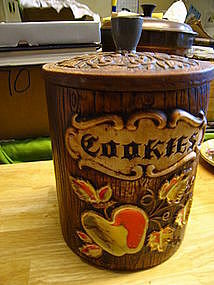 Vintage cookie barrel with apple and leaf design. There are no chips, cracks, breaks or rough rims. There is minor interior crazing, as well as wear to the exterior finish. I need your zip code to calculate the postage.